One of the most common causes of snowboarding injury is lack of skill. This is because the vast majority of injuries occur when the snowboarder loses control, and because the novice lacks proper instruction, the boarder's time in the sport is often cut short. According to the Western Journal of Medicine (WJM), roughly 27,000 snowboarding related injuries occurred in the United States in 1994. Sprains and fractures are the most common snowboarding injuries, followed by contusions, lacerations, dislocations and concussions, reports the WJM. Most injuries (20 per cent) were to the upper body and 50 per cent of the injuries being wrist fractures. Most of these snowboarders were also beginners. The reason for so many wrist injuries is because boarders have both feet fixed to a single board, while their arms are free and are used for balance. "The typical mechanism of snowboarding injury is a forward or backward fall broken by outstretched arms and hyper-extended wrists," according to WJM. While more experienced snowboarders suffer the occasional wrist injury, they are now more likely to injure their ankles now because of the advanced jumps they do. Snowboarders are not immune to lower-body injuries. But when compared to alpine skiers, they occur less frequently and are not as serious. The reason for this is because the snowboarders' feet remain attached to the board during falls, which places less torque on the knees, therefore, less damage is done. However, snowboarders are more likely to fracture their lateral process of the talus (LPT). LPT injuries now account for 15 per cent of all snowboarding-related ankle injuries. "The mechanism of injury is 'snowboarder's fracture' is believed to be dorsiflexion [backward bending] of the ankle with inversion of the hind foot," reports WJM. As stated earlier, the best way to avoid injuries is to take lessons, but also don't try things - like jumps - that are well beyond your skill level. Other causes of injury include muscle fatigue, overall tiredness, alcohol intoxication or a hangover, poor weather conditions, dull edges on hard snow conditions, and not wearing the proper equipment/protection. Wearing proper clothes - layers that include a waterproof top layer - is generally not something a snowboarder will do. They tend to wear street clothes, which puts them at risk for hypothermia. Helmets are also not worn very often by boarders, but they have been proven to reduce the incidence of head injuries. It you choose to wear a helmet, ensure it is either a Central European (CE) standard EN1007 or an American standard ASTM 2040 or Snell RS98. Since wrist injuries are extremely common for snowboarders, wearing wrist guards is not a bad idea, especially for beginners. 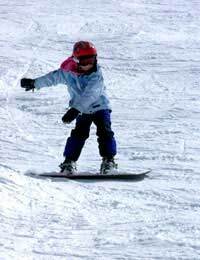 Novice boarders are also best off with soft boots that have ankle reinforcement, which helps to reduce injuries. A little defensive boarding can go a long way to being safe. Attach the board to your lead foot with a security leash. Secure this prior to getting into your bindings. This will prevent a runaway board, which can also injure someone else. When falling, keep arms tucked to your sides with fists clenched - this falling form may prevent a dislocated shoulder and/or broken wrist. When jumping, ensure the landing area is clear. When observing jumps, stay out of the 'spill way' and steep sections where people uphill can't see you. If you feel like you are going too fast, then slow down. If you can't slow down or are a beginner and don't know how, drop to your knees and skid the rest of the way down. "Don't ride straight down unless you know what you're doing or you have a clear slope and won't hit anyone," reports eHow. "Riding down straight can lead to going too fast and catching a small edge to a big and/or hard fall." The other comment shows the importance of receiving instruction in snowboarding, rather than just jumping on and doing it. Knowing how to fall is very much part of boarding, and learning what you can attempt as a beginner and what you shouldn’t. Over-ambition can easily lead to broken bones and other injuries. Good article, I injured myself while I was learning - by not listening to the instructor and falling the wrong way! I sprained my wrist pretty bad because i streched my arms out when I was falling. If you do feel like you're going to fall tuck your arms by your side or up against your chest. Also listen to your instructor they know what they're talking about and don't try jumps before you've mastered the basics -another mistake of mine. Don't be put off by injuries though!